Eggnog the Bulldog is an adorable pup that is less than a year old but has already created quite the following with her sweet, wrinkly face. 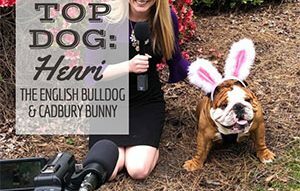 Scroll through her Instagram account (@eggnogthebulldog), and you’ll see her adventures with her mom Jen (including her love of eggnog, of course). 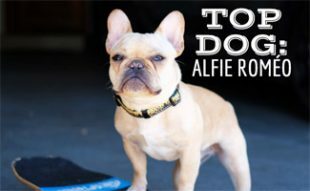 This pup definitely has found a happy home, and we were so thrilled for the chance to chat with Eggnog in our latest Top Dog interview series. 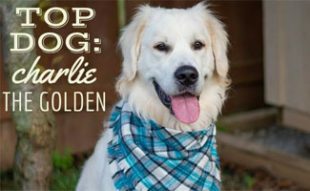 Read on to learn more, including how she helps raise money for dogs and families in need. Where are you from? How did you and your mom find one another? I like to think that I am from the Nog Pole but mommy got me from a wonderful breeder in Arkansas! Mommy and Daddy lost their 12-year-old bulldog Pudge 4 months before I was born and mommy had an especially hard time coping with her passing. Mommy wasn’t entirely ready to get a new puppy, but she decided to start her search for the right breeder none the less. Mommy and daddy looked for months, traveling and visiting Bulldog breeders across the country and nothing seemed to feel right. That is until she took a trip to Arkansas and met my siblings and me at the ripe ole age of 4 weeks! Mommy and Daddy picked me out of a litter of 8 and never looked back! They knew that day that I was their miracle puppy sent here to make them smile again, much like that genuine smile a child exudes on Christmas morning! Mommy always has loved Christmas more than most! She and my Daddy had a Christmas wedding, and she’s definitely one of those people who pumps out Christmas carols in July! Ain’t no shame in her Christmas game! She knew she wanted to name me something unique, something holiday themed and something that would make people smile when they heard it! And I mean come on, who doesn’t want a little Eggnog all year round? How did you find your way into the spotlight in 8 short months?!? I’m not sure to be quite honest, but I feel very blessed to have the following that I do! Plus, my followers aren’t just that, they actually are my family and I love each and every one of them so much! Mom really enjoys taking pics and videos of me and being able to share with the world so that they too can smile, just like mom does, when I do funny stuff (which is more often than not!). When not being adorable on social media, what are your favorite past times? I like to think that I am a certified stick hunter/collector. I live on 5 acres of woods, so Mom walks me through the forest every day and I chew, drag and collect as many sticks as I can along the way! The lucky ones make it all the way back to my front door where mom tries to negotiate them staying outside. 100% of the time she loses that battle and inside they go with me, straight into my custom built living room doghouse! What are some of your favorite toys? I honestly like anything that makes a loud squeaking noise so I can use it to help wake mom up at the crack of dawn to play with me! She loves it too, I just know it!! Tell us about your online store! The Holiday Nog Shop is a store my Mom set up for the holiday season to help raise money for two charities that are near and dear to her heart. Her previous bulldog Pudge battled brain cancer so any chance we get to give back and help other pets with cancer or families dealing with pet cancer makes us feel good! Especially around the holidays! 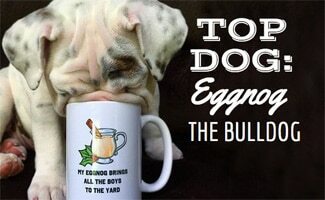 The products being sold are funny Eggnog sayings with my silly mug on them! They are designed to make people laugh and to give everyone access to their daily dose of Eggnog right in their own home! Profits from the sales will go to The Animal Cancer Foundation and the Riedel Cody Fund! Who’s your favorite celebrity dog? I would have to say Max from How the Grinch Who Stole Christmas! No matter the situation Max was always happy because deep down inside he felt the true magic of Christmas! That and he probably had just a little too much Eggnog which will always make you feel a little tingle or two! Here’s a short clip of adorable Max escaping from the Grinch (played by Jim Carey). 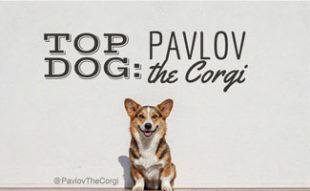 Do you have any tips for puppy parents? Be present, be patient and love with your whole heart! We are not just pets, we are your furbabies, and whatever love you give to us, we will give you back to you ten times over! There is no love like loyal love! Oh man, the sky is the limit! There is a whole forest of sticks out there that need to be inspected and retrieved. I’m still working on mastering the art of snoring louder than my Dad. And once I turn one-year-old I will be sending my application to Santa Paws to become the official year-round Christmas Coordinator of the canine community! Eggnog will no longer be seasonal if I get the job! Some days I’m Noggy, some days I’m nice, but every day I am grateful, to have all of you in my life! Adorable, thanks for sharing your story Noggin’! What questions do you have for Eggnog? Eggnog is so sweet!! Please help get Eggnog Instagram back. I LOVE ❤️ Eggnog. Everyday at work we have a daily dose of Eggnog. We take a small break and look her up on IG. It’s a great small happy break.